The C144 full service sneeze guards are built to provide a clear view of the merchandise while maintaining the required protection. This style has a vertical front shield and a 45° viewing shield. The generally the C144 is used on straight counters, but can be modified for curved or angled counters. There is also an optional removable mid-shelf available. The bay size can be as small as 12" or as large as 60", and it is possible to connect multiple bays together. Consult customer service for custom sizes or larger configurations. 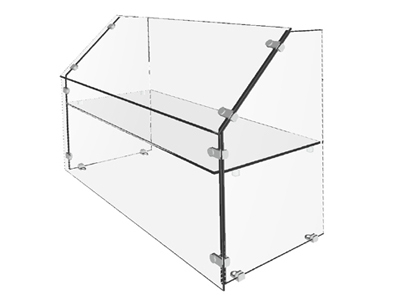 The C144 sneeze guards has four standard supports styles made from 1/2" Clear or Crystal Clear safety glass. The "Open", and "Sculptured" supports are generally used as interior support to allow full counter access. The "Deep", and "Extended" support are used as end support and shelf supports. NSF Certified when Deep or Extended end supports are used and installed correctly. Model C144 generally used as a straight single or multi-bay unit. Inside and Outside corners units can be designed, but addition manufacturing time is required.